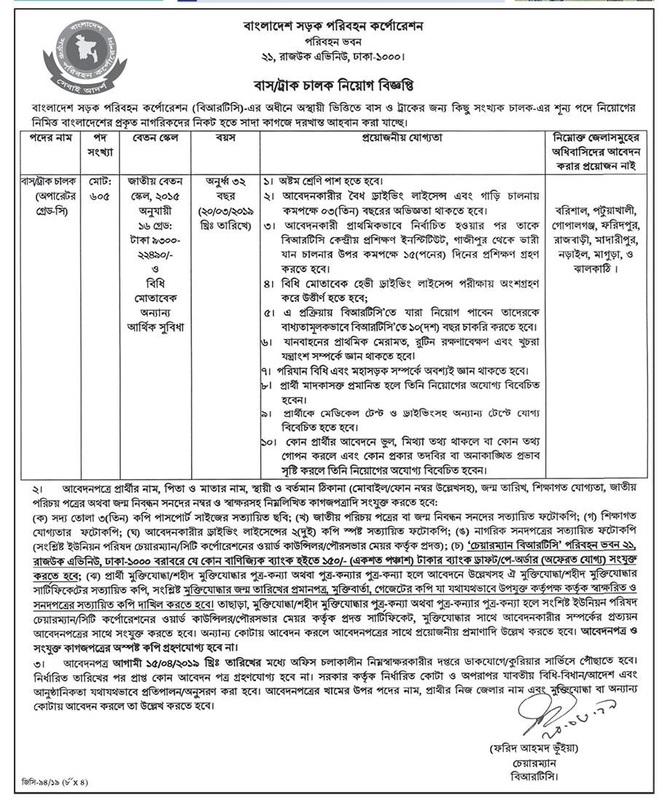 Bangladesh Road Transport Corporation (BRTC) Job Circular 2019 has been published by the authority in daily newspaper and to find in my website BD Jobs Careers www.bdjobscareers.com. As a know the Bangladesh Road Transport Corporation (BRTC) is under the Bangladesh government transport Corporation that managed Road and Transport related all of work around the Bangladesh. In recent times the BRTC looking new jobholder for their corporation empty vacancy. The Job Position Name Operator (Driver). You can check out all of necessary information by BD Jobs Careers. If you are interested for government jobs and hold on government profession, please, below, you can check our added information with job circular image. If you think you are right candidate and suitable for this government advertisement, please to follow their applying process and get ready for Bangladesh Road Transport Corporation (BRTC) Job Circular 2019, interested candidate submit your application by following their instruction. ■Experience Requirements: See Job Circular Image. ■Educational Qualification: See Job Circular Image. ■Age Limit: 18 to 30 Years. ■Type of Jobs: Government Jobs. ■Other Benefits: As per Government Policy. ■Jobs Location: Anywhere in Bangladesh. ■Applying Process: Manual, To Follow Below Job Circular Image. If you want to more all types government jobs circular news 2019 in regally to visit our website in BD Jobs Careers. We published all types latest job circular information including non government jobs in Bangladesh, all newspaper government jobs in Bangladesh, government project jobs in Bangladesh, advertisement of government jobs in Bangladesh, recent government jobs circular, private company job circular, all bank jobs circular 2019, international jobs news, all international NGO jobs in Bangladesh, university lecturer jobs, private and government university jobs circular news, college and university jobs in Bangladesh and so on for jobs seekers. Our main aim to become a best jobs and education portal website in Bangladesh which helps the people. Now, keep connected with us as well as like our Facebook Page and Join Facebook Group. Hope you will be benefited. Thanks for stay with us. This entry was posted in All Jobs, BA Pass Jobs, BD Jobs, BD Jobs Today, Epaper Jobs, Government Jobs, International Jobs, Ittefaq Newspaper, Newspaper Jobs by admin. Bookmark the permalink.